30 x 30 challenge is still going strong and I will give you a new mass outfit update very soon but until then I wanted to share about one of my favourite skirts. This is probably one of the skirts that gets rocked the most for me. A leather look skater skirt I picked up from Yours Clothing last year but being black is wearable in so many ways. Here I teamed the skirt with leopard leggings, a lovely shoulder detailed top from forever 21 and a faux fur hat and muff both last year New look. If like me you have voluptuous hips the. Skater skirts are great. They flare out over your hips and nip in at the waist enhancing those curves. Although booty babes beware they can come up a lot shorter which is why I usually sport mine with leggings. For this look I sassed it up with some vintage inspiration a cute little polka dot top from Primark, Black cardigan also Primark but flowers in the hair, camera bag and necklace change the look up. A good versatile skirt in your wardrobe can really diversify your wardrobe. Step away from the cozy jeans or easy to throw on dresses and once you find your perfect skirt you can rock it with different tops and accessories for a different feel to your look. You also would have seen me sport this skirt before on this style xl vlog. 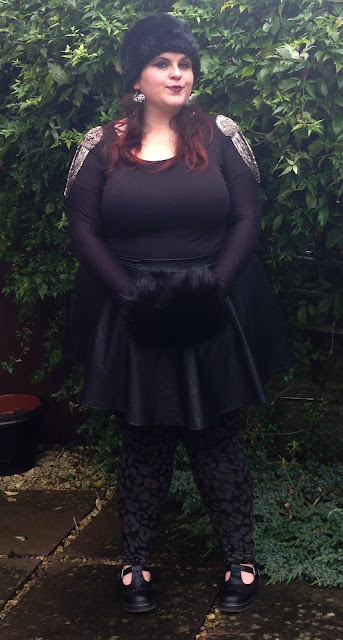 Here I teamed the skirt with trusty leggings, Vans trainers, a lace peter pan collared top from Primark, The cardigan is Collectif gifted by a lovely friend and I flower crowned it up. As you can see I am really putting this skirt to full use for the 30 x 30 challenge. Teaming with 9 of my other items (including footwear). Do you have a favourite skirt? Thanks for stopping by and don't be a stranger my sweets! What a lovely skirt, something a little bit different with it being leather look but it seems to be super versatile. 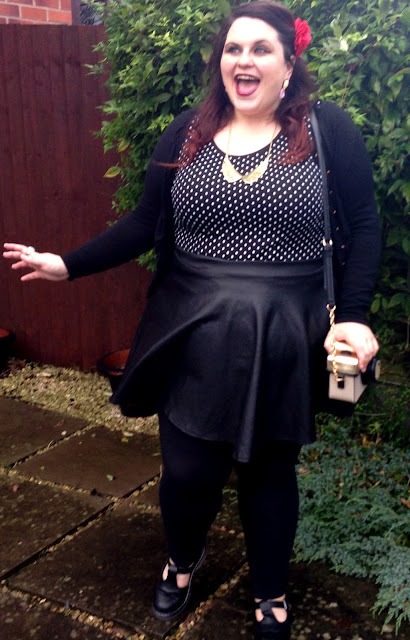 There's an ASOS Curve leather look skirt I've had my eye on but wondered if I'd end up actually wearing it, this post has helped me make up my mind that I totally will. Loving the skirt. So stylish, you look great. Skater skirts are my favourite look at the moment. You look fab, loving the faux leather. Skirt is gorgeous! It would definitely be a go-to piece in my wardrobe.